It sounds funny, I have never been a big fan of sweet corn, but I like it, like to hold it, like to smell it after being grilled. Well, I can’t really have much corn anyway, because my stomach sometimes aches after having it. But, I love to play with it. :)) I remember when I was little, my auntie would bring baskets and baskets of freshly picked maize back to my grandparents when the harvest season of corns came, and we, the small kids would happily be there to ‘help’ husking. Only later it turned into a ‘fashion’ design game, as we started ‘braiding’ the peels into shoes. We laughed in between the piles of corn’s peels — the best of carefree childhood. From mid autumn to winter, ‘grilled’ corn on cob is very popular in northeast China. The sellers would put a small coal grill around the corner of the schools, or in the street food markets, grill and sell the corn. The best corn is the one that is slightly burnt on the very surface. I thought I have totally forgotten the smell over these years, but when I walk in the streets in Spain, there are many small ‘grilled corn’ stall in the streets, just like my hometown. 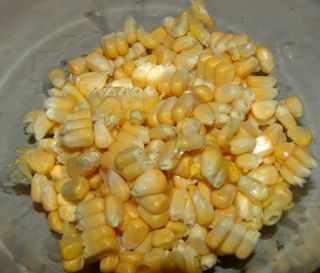 I decided to make this dish because of the autumn ‘corn’ season. 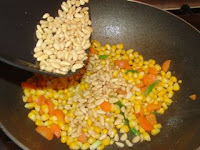 There are many fresh ‘corns’ in the markets – a must eat ‘autumn recipe’. :)) (Probably a little bit late now.) It is the best time in the year to taste the good sweet corn. So I made this dish with fresh sweet corn, otherwise, sweet corns in ‘cans’ can also be used. 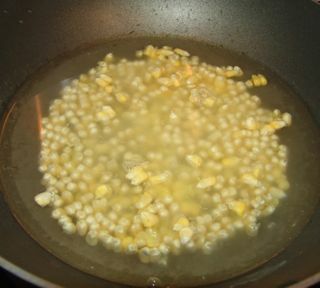 This sweet corn recipe only became popular in China in recent years. In northeast, people like to call it ‘lady’s dish’, as it is a bit sweet (from the corn), and the taste is very mild and light. 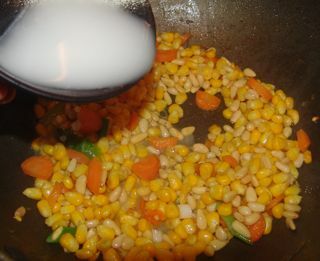 There are many slightly different recipes in different regions in China, but sweet corn and pine nuts are always the main ingredients in the recipe. For example, I made it with carrots, but there are some recipes with sausage and peas or green peppers. It is a very ‘simple stir fry’ dish, there are not many seasoning, the flavor is mainly influenced by the pine nuts and spring onion. 1) Remove the sweet from its cob (raw). 2) Boil the corns in water for 4/5 minutes, rinse. 3) Chop carrot and spring onion into small pieces. 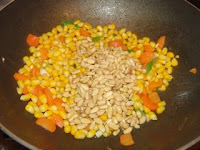 4) Prepare the corn flour mix for thickening and pine nuts. 2) When oil is hot enough, add chopped spring onion in. 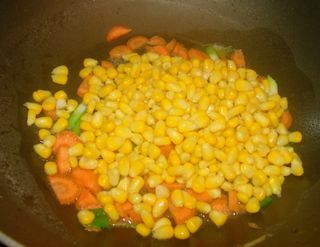 3) When the fresh smell of the spring onion out, add boiled sweet corns and Chopped carrot in, stir well. 4) Add 1/2 teaspoon of salt, 1/3 teaspoon of sugar, mix them well with the other ingredients in the wok. 5) When the sweet corn and carrot is done, add pine nuts in, quickly mix them well. — Done!! It can be added a few drops sesame oil. Be quick after putting pine nuts in, you still want to keep its crunchiness. Apart from the taste, the appearance of the dish seems quite important for this recipe — the surface of the ingredients should be smoothly coated with the sauce, and almost ‘shining’ in the light, some chef would drop some ‘cooked’ oil before take the dish on the plate. It is good to go with plain rice, Chinese bread (steamed bread or bing). Hope you like it! !